Yeah-tongues. This is where we’re at. Apparently (and this is a compliment), once you reach your 1000th variety of candy, you start digging deep into the body parts arena. On that note, I’m pretty sure Jonny Guru Jr. would ADORE gummy butts, so if anyone knows of any…let me know. Look closely at the bag. Can you see the way some of the tongues appear to be a bit…wet? Sticking to the bag? This is important for later-write a crib note if you need to. They’re gorgeous, right? Odd tongues, to be sure. Possibly for a two-mouthed creature? 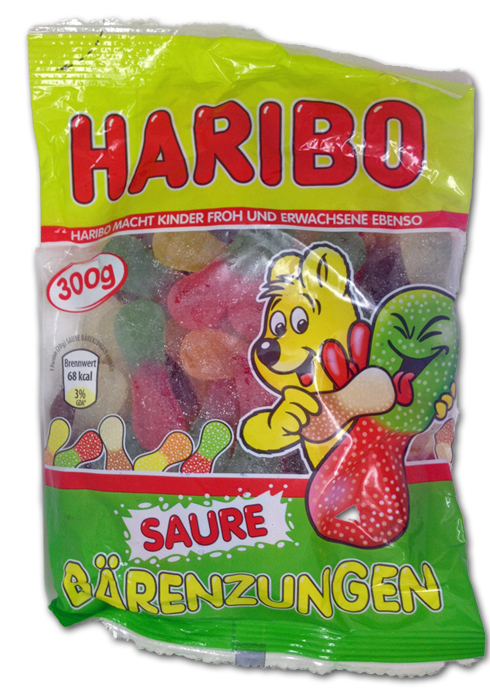 As always, Haribo gets the flavors right- there’s cola, lemon/orange, and (I think) cherry/apple. It doesn’t matter so much though: these flavors might not be perfectly representative of their intended origins, but they’re on point, full, and most importantly, they all have perfect sour notes. 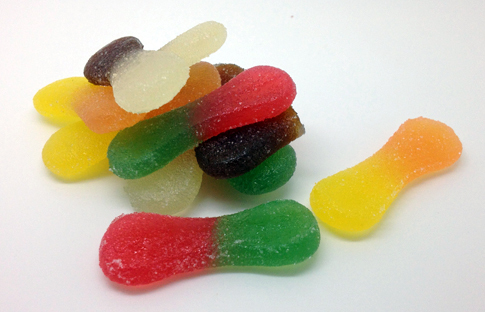 Other candy companies should really take a page out of Haribo’s when it comes to sour. Too sour is tongue shredding, and that ‘aint fun. Mildly tart should be standard operating procedure for all flavors-but don’t call that sour. Sour should be tongue tingling (forgive the softball there) and saliva inducing. At least a little. These hit the mark perfectly. Back to the moisture issue. 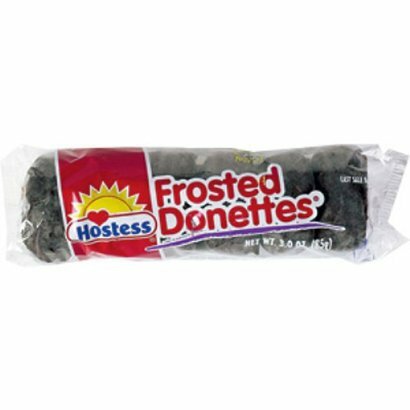 In the good old days when I was in high school, in the mid 18th century, me and my buddies (like all other normal people) had a fixation over Hostess chocolate donuts, or as they were termed “frosted donettes”. We called them “Sweaties”. But that was out of love. See how some of them appear to have a bit of moisture, sticking to the bag? This picture doesn’t do them justice, there was always a lot more of it. We tried to find the packet with the least amount of it. But that didn’t mean we didn’t like donut sweat-we were just somewhat scared of it. This same tenant holds true for these tongues. They almost have a bit of moisture on them, and are sticky as all get out. I think that’s a byproduct of poor storage, but I’ve never seen them any other way. Ordinarily, that might put me off-but not for these. These are WINNING. The flavor and sour is so tasty. Also, I LIKE the stickiness on these, if only because it’s different. If these were easier to get, they’d be a staple for me. But wait- they ARE! Click the link below to procure a tub. Become one with the sweaties.